Varve sequences and individual outcrop or bore hole measurements from the northeastern U.S. and adjacent Canada that were not a part of the original New England Varve Chronology (NEVC, lower and upper Connecticut varves) of Antevs or the North American Varve Chronology (NAVC) are available here for download. 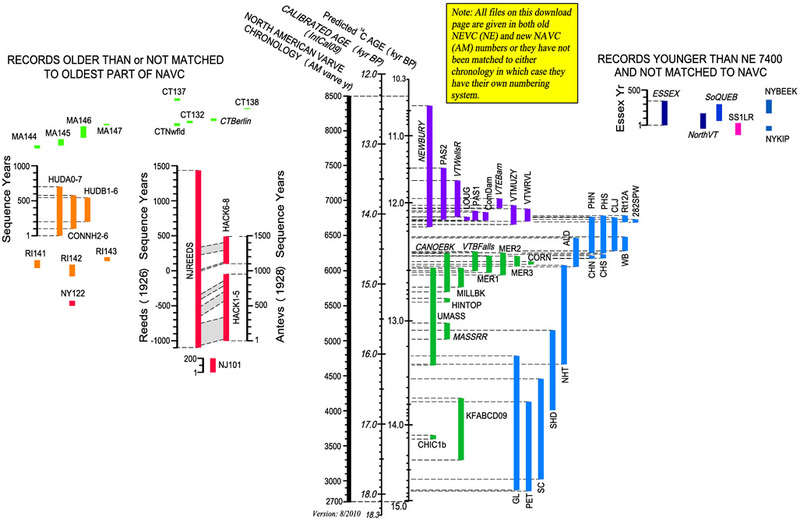 These records include some long sequences and some sequences correlated by Antevs (1928) over long distances but not connected to the NEVC or NAVC. There are also more recent individual outcrop records that either have been matched to the NEVC and NAVC or are unconnected records. For links to the original NEVC varve sequences of Antevs (1922, 1928) go to the NEVC Normal Curves Download page. For the NAVC varve records go to NAVC Normal Curves Downloads [link] page. For a translation of NEVC (NE) varve year numbers to the new NAVC (AM) varve year numbers or vice versa go to the NEVC/NAVC Conversion page. Individual varve sequences can be downloaded: 1) from the varve file menu or 2) from a map showing their geographic location (area from which varve sections were measured to produce the varve sequence). You also have the option of downloading a folder with all of the files. The downloadable data files are all in ASCII text files. Some files have just varve year and total couplet thickness while others may have varve year and summer bed, winter bed, and total couplet thickness. Headers in the data files explain their content. All files are ASCII text files assembled with separate columns for varve year and either 1) annual couplet thickness in centimeters, or 2) summer layer, winter layer, and total annual couplet thickness in centimeters. All varve year numbers run from low number (older) to high number (younger). When a file or group of files is described as “not connected” this means that the files have not been correlated or matched to either the NEVC or NAVC and the records will have their own individual numbering system. Right-click on any of the links in blue below and choose "save file as..." or “save link as..." to download the desired file. Those links that are named XXXXfolder are .zip archives which contain the associated text files. You must uncompress these files using 7zip (free), winzip (fee) or the integrated Windows or Mac decompression utilities. NOTE: All NAVC files will have a file name ending in "AM". All items below are links to individual Notheastern U.S. varve data files or folders. NJ101.TXT	Varves 1-200, Little Falls, NJ, site #101 plot from Antevs (1928). NJREEDS.TXT	Varves -1097 to 1434 from Lake Hackensack plots of Reeds (1926), Little Ferry, NJ. HACK1-5.TXT Varves 1-952, Lake Hackensack, northeastern NJ, HACKENSACK 1-5 plots of Antevs (1928). Note: same varves as Reeds (1926) but different numbering system with more varves than counted by Reeds in same sequence. Intervals that match Reeds are: A20 to 333 = R-1063 to -750, A560 to 694 = R-641 to -507, A780-852 = R-405 to -333. HACK6-8.TXT	Varves 1101-1490, Lake Hackensack, northeastern N.J., HACKENSACK 6-8 plots of Antevs (1928). Note: same varves as Reeds (1926) but different numbering system with more varves than counted by Reeds in same sequence. Intervals that match Reeds are: A1101 to 1120 = R1 to 20, A1290 to1400 = R230 to 340. Most of sequence is non-glacial. NY122.TXT	Varves 1-71, Glen Head, north shore of Long Island from Antevs (1928). RI141.TXT	Varves 1-102, in Antevs’ (1928) section 141 south of Providence in bluff on west side of Narragansett Bay near Gaspee Point. RI142.TXT	Varves 1-157, in Antevs’ (1928) section 142 south of Providence and east of Narragansett Bay in clay pit near Barrington. RI143.TXT	Varves 1-54, in Antevs’ (1928) section 143 in providence near Seekonk River along railroad. Section rests on bouldery substrate, probably till. MA144.TXTVarves 1-41 in Antevs’ (1928) section 144 in brickyard at Taunton. MA145.TXTVarves 1-89 in Antevs’ (1928) section 145 in brickyard at Middleboro. MA146.TXT Varves 1-165 in Antevs’ (1928) section 146 in brickyard at Bridgewater. MA147.TXTVarves 1-19 in Antevs’ (1928) section 147 in brickyard north of Bridgewater. HUDA0-7.TXT Varves 1-700, Hudson Valley, Haverstraw, N.Y., NEW HAVEN A1-A4 plots of Antevs (1928). HUDB1-6.TXT	Varves 101-577, Hudson Valley, Haverstraw, N.Y., NEW HAVEN B1-B3 plots of Antevs (1928). CONNH2-6.TXT	Varves 201-544, Quinnipiac Valley, New Haven, Conn., NEW HAVEN C2-C3 plots of Antevs (1928). CTBr136.TXT – Varves 1-16, plot of Antevs’ (1928) section 136 near Berlin, Antevs’ correlation to other Berlin records not as clear as correlation of other two. CTNwfld.TXT	Varves 1-39 constructed by Antevs (1928) from three sections at Newfield, Conn. north of Middletown. One section interpreted by Antevs to be overlain by clayey and stony till. CT132.TXT	Varves 1-32 of section 132 of Antevs (1928) NW of Newfield, Conn. Not connected to any other section. Sequence overlies till and is overlain by package of “compressed” and deformed varves and till. CT137.TXT	Varves 1-33 with a gap in section 137 of Antevs (1928) in New Britain, Conn. Antevs refers to this as the New Britain sequence. Not connected to any other sequence. CT138.TXT	Varves 1-12 in section 138 of Antevs (1928) in Connecticut Valley north of Middletown. Section rests on till and is overlain by till composed of deformed varves. PET1-2mergAM.TXT, Varves AM 2853-4129, Composite of two side-by-side drill cores collected and measured in 2009 by Laura Carter, Jeremy Wei, Chris Smith, and Jack Ridge at Petersen Farm in South Windsor, Connecticut. GL1-2mergAM.TXT, Varves AM 2868-4785, Composite of two side-by-side drill cores collected and measured in 2009 by Laura Carter, Jeremy Wei, Chris Smith, and Jack Ridge in Glastonbury, Connecticut. SC1-2mergAM.TXT, Varves AM 3020-4457, Composite of two side-by-side drill cores collected and measured in 2009 by Laura Carter, Jeremy Wei, Chris Smith, and Jack Ridge in Scantic, East Windsor, Connecticut. KF-ABCD09-AM.TXT, Varves AM 3297-4181.Connecticut Valley, Kelsey Ferguson Brickyard, Redland Brick Co., South Windsor, Conn. as published in Stone and others (2005) and expanded in 2009. NEVC and NAVC records measured by Jack Ridge, Laura Carter, Jeremy Wei, and Chris Smith from outcrop cores (summer, winter, and total couplet thickness). Five adjacent outcrop transects of identical thicknesses were fused to form the varve record. CHIC1b-AM.TXT, Varves AM 3596-3651, Along Center Street in Chicopee, Massachusetts on east side of Connecticut River. Sequences rests on till composed of reworked lake beds, probably from Chicopee readvance, and grades upward into deltaic sand. NEVC and NAVC records measured by Jack Ridge and Charles Pace at outcrop. SHD1-2mergAM.TXT, Varves AM 4009-5151, Composite of two side-by-side drill cores collected and measured in 2009 by Laura Carter, Jeremy Wei, Chris Smith, and Jack Ridge in South Hadley, Massachusetts. UMASS-AM.TXT, Varves AM 4651-6042, From long cores, Connecticut Valley, Amherst, Massachusetts on Univ. of Massachusetts campus as reported in Rittenour (1999). Original NEVC measurements with notes on errors, core conditions, and gaps between core drives and for contorted layers. NAVC version is corrected. NHT1-2mergAM.TXT, Varves AM 4665-6079 Composite of two side-by-side drill cores collected and measured in 2009 by Laura Carter, Jeremy Wei, Chris Smith, and Jack Ridge in North Hatfield, Massachusetts. RRThom84.TXT – Varves NE 5103-5238. Digitized from graph in Thomas (1984). HINTOP-AM.TXT, Varves AM 5552-5606, NEVC and NAVC varve records from Connecticut Valley, Hinsdale, NH, measured at outcrop by Jack Ridge, Sarah Brown, and Jake Woland. CanBk5yr.TXT – 5-yr running average of CANOEBK.TXT described above. CanBk5yr-AM.TXT – 5-yr running average of CANOEBK-AM.TXT described above. MILLBK-AM.TXT, Varves AM 5767-6039, NEVC and NAVC varve records from Mill Brook, Connecticut Valley, Putney, VT. Measured at outcrop by Jack Ridge. ALDmergAM.TXT, Varves AM 6058-6469, Composite of two side-by-side drill cores collected and measured in 2007 by Catherine Beck and Jack Ridge south of Aldrich Brook in Westmoreland, NH. This section extended Antevs’ Lower Connecticut Varves and created an overlap with the Upper Connecticut Varves. CHN1-2mergAM.TXT, Varves AM 6174-6217, Composite of two side-by-side drill cores collected and measured in 2008 by Jack Ridge in north end of town of Charlestown, NH. This section contains very thick ice-proximal varves. CHS1-2mergAM.TXT, Varves AM 6179-6234, Composite of two side-by-side drill cores collected and measured in 2008 by Jack Ridge in south end of town of Charlestown, NH. This section contains very thick ice-proximal varves. MER1-AM.TXT, Varves AM 5974-6215, NEVC and NAVC records from bank of Merrimack River, Garvins Falls Rd. north of Soucook River, Concord, N.H. Measured at outcrop by Sharon Zaboly Kelley and Jack Ridge as reported in Ridge and others (2001). MER2-AM.TXT, Varves AM 5939-6258, Varve records from Hayward Brook, Penacook, N.H. Measured at outcrop by Meredith Kelly and Jack Ridge as reported in Ridge and others (2001). MER3-AM.TXT, Varves AM 6065-6209, Bryant Brook, Canterbury, N.H. Measured at outcrop by Meredith Kelly, Rich Pendleton, and Jack Ridge as reported in Ridge and others (2001). 12A1-2mergAM.TXT, Varves AM 6696-6789, Composite of two side-by-side drill cores collected and measured in 2008 by Jack Ridge, Rob Bayless, and Jody Dean along west side of Rt. 12A in North Charlestown, NH. 282SPW-AM.TXT, AM 6690-6735, Outcrop measurement by Jack Ridge in 2002 along bank of Connecticut River in North Charlestown, NH. PHSmergNE.TXT, NE 6569-7033 (as adjusted to match original Upper Connecticut Varves of NEVC of Antevs, 1922). PHSmergAM.TXT, AM 6252-6789, Composite of southern Perry Hill site (along Ox Brook) where two side-by-side drill cores were measured in 2007 by Emily Voytek and Jack Ridge in Perry Hill Basin, Charlestown, NH. PHNmergNE.TXT, NE 6570-7006 (as adjusted to match original Upper Connecticut Varves of NEVC of Antevs, 1922). PHNmergAM.TXT, AM 6252-6769, Composite of northern Perry Hill site where two side-by-side drill cores were measured in 2007 by Emily Voytek and Jack Ridge in Perry Hill Basin, Charlestown, NH. WB12mergAM.TXT, Varves AM 6283-6484, Composite of two side-by-side drill cores collected and measured in 2008 by Jack Ridge, Rob Bayless, and Jody Dean in Wethersfield Bow, VT.
CLJmrg12AM.TXT, Varves AM 6283-6761, Composite of two side-by-side drill cores collected and measured in 2008 by Jack Ridge, Rob Bayless, and Jody Dean Along west side of Rt. 12A in North Charlestown, NH. NEWBswT.TXT, Varves NE 6944-8676, Newbury, VT.
NEWBswT-AM.TXT, Varves AM 6627-8358, Newbury, VT.
NEWB5yr.TXT, 5-yr running average of total varve thickness for the Newbury, VT. section (NE version NEWBswT.TXT listed above). NEWB5yr-AM.TXT, 5-yr running average of total varve thickness for the Newbury, VT. section (AM version NEWBswT-AM.TXT listed above). LOUG1935-AM.TXT, Varves AM 6718-6769, Comerford Dam, Vt., Connecticut Valley, NEVC and NAVC measurement of Lougee (1935). ComDam-AM.TXT, Varves AM 6718-6836, NEVC and NAVC versions near Lougee’s Comerford Dam site in Vermont, average of three transect measurements by Marc Brochu and Jack Ridge as published in Ridge and others (1996). PAS1-AM.TXT Varves AM 6721-6858 Passumpsic Valley, East Barnet, VT., Inwood area of Antevs (1922). NEVC and NAVC measured at outcrop by Mark Brochu and Jack Ridge as published in Ridge and others (1996). ESSEXA.TXT	Varves 1-345, Winooski and Lamoille Valleys, near Burlington in Essex Junction area, ESSEX A1-A2 VT plots of Antevs (1928). ESSEXB.TXT	Varves 55-153, 158-284 Winooski Valley, near Burlington in Essex Junction area, ESSEX B1-B2 VT plots of Antevs (1928). ESSEXC.TXT	Varves 78-305, Lamoille Valley, Cambridge, Vt., ESSEX C1-C2 VT plots of Antevs (1928). VTMUZY-AM.TXT Varves AM 6661-6936 (intermittent match) Muzy Road section in Dog River valley, 6 km SW of Montpelier (Larsen and others, 2001). Measured at outcrop by Fred Larsen. Correlated by Jack Ridge to NEVC and NAVC. VTWRVL-AM.TXT Varves AM 6706-6886 (intermittent match) Wrightsville Dam section in North Branch of Winooski River 5 km north of Montpelier (Larsen and others, 2001). Measured at outcrop by Fred Larsen and Stephen Wright. Correlated by Jack Ridge to NEVC and NAVC. VTCol160.TXT – outcrop record (Antevs’ section 160, local years 1-175) from Malletts Brook, Colchester/Milton line. VTFrfx.TXT - record from Antevs’ sections 161-163 (local years 1-178) from Fairfax. VTCam167.TXT - record from Antevs’ section 167 (local years 1-26) from Cambridge. VTOrl175.TXT - record from Antevs’ section 175 (local years 1-104) from Orleans. NYKIP.TXT	Varves 1-67 in bluff section at Keeseville Industrial Park on Ausable River, Keeseville, New York. Varve section rests on till. Measured in outcrop cores by Jack Ridge. Not connected to any other sequence. NYBEEK.TXT	Varves 1-194 with gaps of uncertain duration, stream cut along Ray Brook in Beekmantown, New York. Varve sequence rests on till. Sequence may not be useful for regional correlation because of gaps and changes in varve thickness over small distances at outcrop. Measured from outcrop cores by Jack Ridge and Katie Matthews. Not connected to any other sequence. QUE144.TXT - record from just north of US border at Antevs’ Canadian section 144 (local years 1-272) along Tomifobia River near Beebe. QUE148.TXT - small 15-yr section resting on till at Ascot NE of Sherbrooke, Antevs’ section 148. QUE149.TXT - record from Antevs’ section 149 (local years 1-55) 38 km NW of Sherbrooke near Richmond. QUEDanv.TXT - section on Riviere Landry near Danville (local years 1-103 of Parent and Occhietti, 1999). The map below has links that will take you to the text file download for the individual varve sequences outside of New England, according to the location or section of a valley where varves were measured to create the sequence. The timeline below has links that will take you to the downloads for the individual varve sequences outside of New England according to age. The plot shows how the different sequences of the NEVC overlap in time.